Figure A90. Venezuela anomaly, interpreted as the Venezuela slab, with (horizontal) [vertical] cross sections through (A)[D] the UUP07 p-wave) and (B)[D] the combined SL2013 and S40RTS s-wave models at 1090 km; C) the location of the modern geological record that we interpret to have formed during the subduction of the slab. 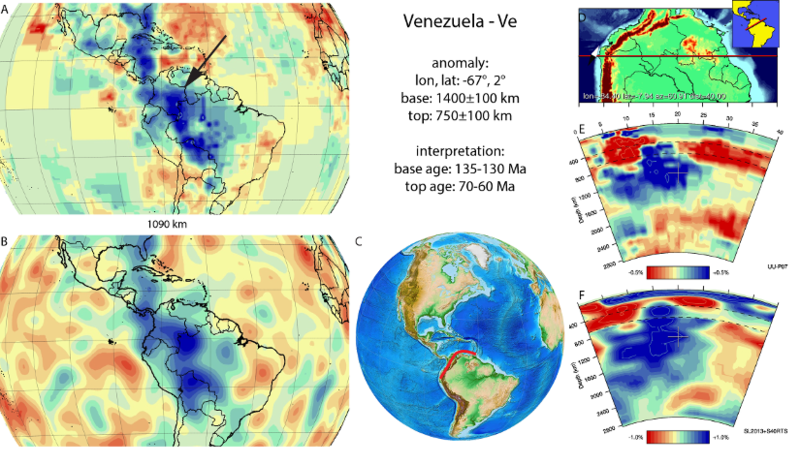 The Venezuela anomaly (Figure A90) is located below northern South America from the mid-mantle up to the upper part of the lower mantle. It was first identified in van der Meer et al. (2010). It was interpreted as the sGAC slab (Southern Great Arc of the Caribbean) by van Benthem et al. (2013), who inferred a Cretaceous to Eocene subduction period for this slab. Subduction of the Venezuela slab is likely associated with volcanic arc rocks in the southern Caribbean region (Boschman et al., 2014), which on e.g. Tobago date back to ~130 Ma (Neill et al., 2012). Pindell et al. (2012) suggested that subduction of the Venezuela slab started sometime before the geological records mentioned above formed, and estimated an onset of subduction of 135 Ma. Arrest of the southern Caribbean arcs in the latest Cretaceous (Neill et al., 2011), and subsequent overriding of South America over the Venezuela slab in kinematic reconstructions (Pindell and Kennan, 2009; Boschman et al., 2014) suggests that break-off of the Venezuela slab occurred around 65±5 Ma, after which the northern part of the slab Hispaniola slab) retreated farther northward (see also van Benthem et al., 2013).